Tilt your TV to reduce glare from the sun - no morecompromised picture quality!!! Cable management design: large opening in center ofback-plate provides space for electrical wires access. Safety screw is used to avoid the movement of TVs afteryou hang it on the wall bracket. Rigorously stress tested by us to 3 TIMES the maximum TVweight for your peace of mind! Mounting Screws Plastic Anchors and Bubble Spirit hardwareis included. Integrated bubble level assures easy installationalignment. 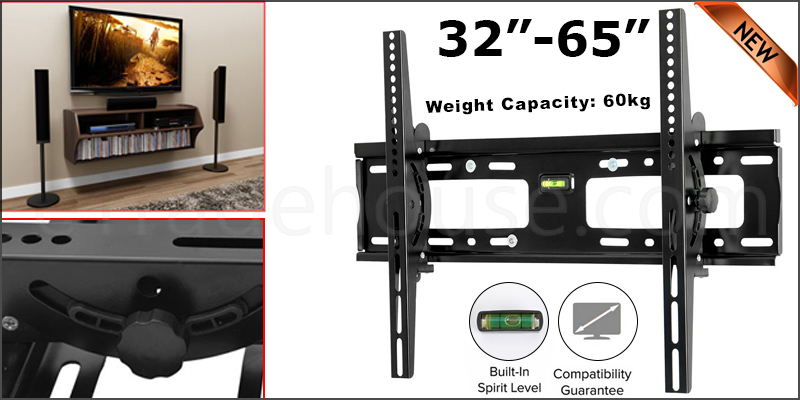 All TV Wall Bracket should be installed on concrete wall,solid brick wall and solid wood wall. Do not install on hollow and floppywalls. Tighten the screw so that wall plate is firmly attached,but do not over-tighten. Over-tightening can damage the screws reducing theirholding power. Do not remove screw or loosen screw if the TV is engagedwith the mount. Doing so may cause the TV screen to fall. All TV MOUNTS should be installed by specialist.